One of the Lugong in heavy goatskin robes and with his face painted half white and half black walking along the Barkhor brandishing a black yak tail. There are monks with long sticks around him. Some of his entourage are running in front of him picking up money which people are throwing to the Lugong. The occasion is the ceremony of the Lugong gyalpo (glud 'gong rgyal po) which took place on the 29th day of the second Tibetan month. Other Information - Setting: Richardson mentions that he saw this ceremony on three occasions so one can assume that the photographs of the ceremony are from three different occasions. He provides a very full description of the proceedings in Ceremonies of the Lhasa Year, 1993, London: Serindia Publications, pp. 61-71, "In this ceremony two men dressed in shaggy goatskins and with their faces painted half black and half white are driven out of the city in a performance which has a superficial resemblance to the ritual recorded in other civilizations where a scapegoat is expelled bearing with him the sins of the people. ... of the two men on whom the burden fell one was a poyen , servant, of the magistrates of the Sho whose other duties were to flog criminals and look after the neighbouring parks; the other was chosen by the villagers of Phenpo who were tenants of the Kundeling monastery in Lhasa. (p.62) Unlike the majority of ceremonies at Lhasa this one does not start until midday. By then a crowd has gathered around the courtyard in front of the main entrance to the Jokhang. 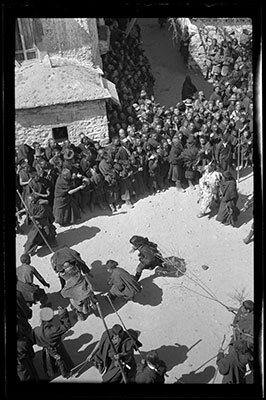 Then the two Shengo of Drepung with their deputies,attended by brawny monk police carrying long poles, staves and sticks, march gravely across the courtyard and sit on a bench below the Dalai Lama's window. A long blast from two silver horns on the west side of the courtyard announces the emergence from the Jokhang of the Changchubling monks who perform a short ritual of exorcism to the accompaniment of oboes and cymbals. When that is finished a party of Black Hat (Shanak) monk dancers, also from Chanchubling, wearing tall broad-brimmed hats surmounted by flame-like fretwork and a conical gold ornament, perform the slow pirouettes of their tantric dance, gesturing with wide, flowing sleeves and holding a skull cap in one hand and a dorje in the other. While they dance the lopon, the senior teacher of Changchubling, enveloped in a red cloak and wearing a yellow mitre, comes to sit on a high cushioned seat facing the Dalai Lama's window." p. (64-5). The Tibet Album. "Lugong walking along the Barkhor with entourage" 05 Dec. 2006. The Pitt Rivers Museum. <http://tibet.prm.ox.ac.uk/photo_2001.59.9.11.1.html>.